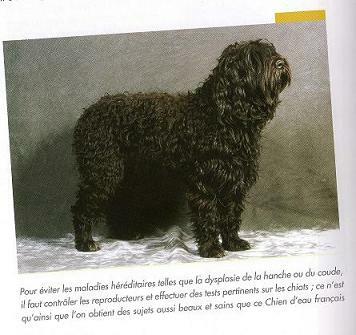 ....and how things get interpreted and misinterpreted and finally distorted....about the crossbreeding of an Irish Water Spaniel with a Barbet. 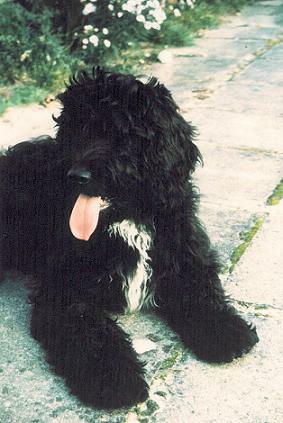 It has been said (among other things) that the Barbet was also redipped with an Irish Water Spaniel. That is true and has been documented since 2003. 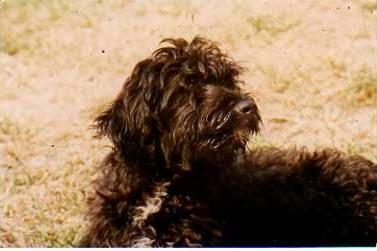 It must be known that the barbet Hercule was used to mate an IWS. Because there was epilepsy in the IWS line and it was to help get it out as Hercule was healthy.That's all. This has happened in many breeds and was accepetd as a fact. 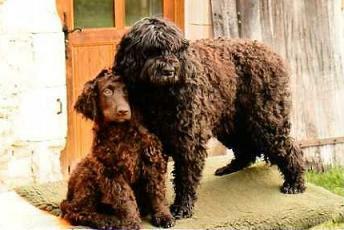 Now, when the pups were born, they were not all IWS or Barbet...there was both. Logical! F1 typed mom and F1 typed dad. 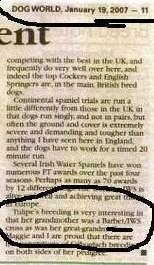 So the F1's typed IWS were shown to an IWS judge and confirmed as IWS and the Barbet typed dog was hidden in a litter of Barbet and was a Barbet. Period. Seeing the atmosphere of slander at the time, a bit like right now, why would anyone want to venture the truth? The more truth, the more attacks. So you, as a breeder, did what you thought was right. And you didn't trust anyone to share the secret, even those who wondered...or had doubts. 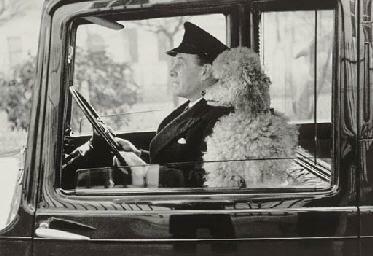 So, have a look at Hercule and the IWS pup. 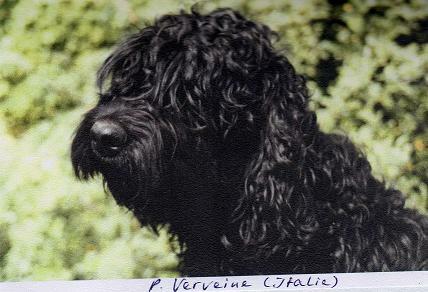 Then have a look at Verveine. At the same time look at Estar des Marécages du Prince, born before Hercule...and who very surely( you don't need DNA to prouve it!) 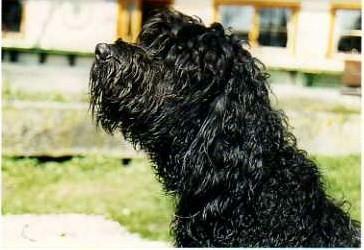 had Barbet in her, along with Coccolina and Valençay and Valdepenas, and many more. Look around, you will see them being born in litters all over the world. Now, they also come in a lovely brown, perhaps attributed to the IWS? Estar’s pedigree does not reflect what "really" happened but one can definitely see the ressemblance. DNA not needed either. Compay II also has a drop of IWS, but it certainly has not shown up so far anywhere and his litter with Bijou, being very homogenous would be at least an F3 in the chain. At F4, you have reached a purebred again. That's what some of us are working towards. Look at how similar their heads are, and the overall morphology. It's more difficult to look at the body and the coat as the photos were taken with dogs at different ages.A 5-month old puppy's coat has not much a do with a 3-year old. None look like poodles or Spanish water dogs, either. They still look the same today! Below is the link to the article that prompted what I have written it. I do not know who wrote it.
" It would appear that originally, the IWS was issued from a crossing of a Barbet and a long haired dog, a spaniel perhaps. No one can be sure of it.The objective being a dog capable of tracing water fowl. 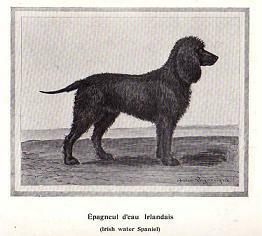 It is certainly the best water dog, and none other can be compred to it, none other that our Barbet.The IWS would have a better nose". A slice of the article. You can order back issues...Dog World; in the UK. The only other document I know relating the usage of a Barbet to redip into the IWS, is the Fishmarket article published with Mrs I. Fischer's permission by the IWS club of the Netherlands, a few years ago.